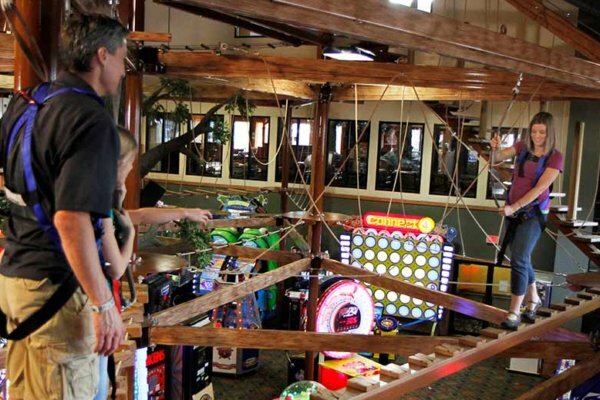 Located in the Wild West region, The Northern Lights Sky Ropes Course is perched 30 feet above one of our mega arcades! Wearing a full-body safety harness, you’ll climb your way around 42 challenges with varying degrees of difficulty. Walk the tight rope, balance on rickety bridges and brave the balance beams. This attraction is located in the Wild West region of the Wilderness Hotel near Timberland Play Park. The maximum weight for this attraction is 300 pounds. Guests must be 42" tall to enjoy this attraction. Dry clothes and shoes required. Shoes must have closed-toes.